This blog post supplements the RSEC report, “News from the ABA Recording Standards and Ethics Committee”, published in the October 2014 issue of Birder’s Guide. Many of the recent changes made to the Recording Rules and Interpretations were simply minor language updates or updates relating to where we are now, 10 years after the last update to these standards. The changes that actually directly affect how we count/list birds are discussed below. It is important to note all of these rule changes must be applied to official lists submitted to the ABA’s Listing Central. Thus, as examples, you may now add to your list(s) that Gray-cheeked Thrush you heard real-time via your house rooftop microphone in 2009, but you must remove from your list(s) the Northern Saw-whet Owl you banded but did not see released. Acknowledgements – The RSEC received very helpful input from many birders leading up to these updates, and we are very grateful to all of you that shared your thoughts with us. In particular, we thank Michael Retter, Jeff Skrentny, and Geoff Williamson for the extensive food for thought they provided. Rule 1.C – As remote audio-visual devices become more popular, the RSEC felt it was necessary to address their usage and when a bird may or may not count if detected by a remote device. We hope the language is pretty self-explanatory as to when the recorder may count a bird detected with remote devices. For Rule 1.C(ii), a microphone counts as a sound augmentation device. Rule 2.B(iii) – It was the unanimous consent of the RSEC that once an exotic species is accepted to the ABA official checklist, if it is recorded during its time on that checklist, it should always count on a birder’s list, even if the exotic species becomes extirpated or is removed for other reasons at some future point from the official ABA checklist. Some birders spend a considerable amount of time and effort locating ABA “official” exotic species to record on their lists. The RSEC felt strongly that a birder should not be penalized for taking the time and effort to record the species and then have that species removed from their list when it is taken off of the official ABA checklist. Although the Crested Myna is the prime example of this rule that everyone references, the same might someday be said about several of the ABA Area’s long-present exotic species, including, for example, Spot-breasted Oriole, Budgerigar, and Red-whiskered Bulbul in Florida. If a birder successfully makes the effort to record an exotic species during its tenure on the ABA checklist, then it is the decision of this RSEC that the birder should be entitled to keep that species on his/her list permanently. Rule 2.B(v) – The RSEC, with three rounds of voting four in favor and one against, voted to allow native reintroduced species (NRIs) to be countable as soon as that species is documented successfully hatching young in the wild (we are working on compiling the threshold dates of countability for each population concerned). This primarily affects the countability of California Condor and Aplomado Falcon, as well as some populations of, for example, Trumpeter Swan and Whooping Crane. First and foremost, this decision is not a decision by the RSEC to redefine or argue the rules of successful establishment currently used by the ABA Checklist Committee (CLC) or by any state bird records committees (BRCs), such as Texas and the Aplomado Falcons. The previous recording standards required NRIs to meet the same set of standards of establishment as exotic species. It was the consensus of four of the RSEC members that listing should be more about the enjoyment and respect of the species involved, versus the science of establishment. The pure birding joy of seeing an Aplomado Falcon perched in that searing early morning Texas light, or hearing and seeing the immensity of a California Condor soaring up and out of the Grand Canyon – these native joys should not be marred by an asterisk of countability. It was also consensus among the four members that making these species countable could only improve awareness about the serious conservation issues facing these species. Rule 3.B – The RSEC unanimously agreed that birds that are rehabilitated and then released may be counted upon their release. The RSEC also unanimously agreed in principle that to prevent a bird’s access to medical care that needs it so that other birders may count the species prior to its rehabilitation is completely unethical. Rule 3.C(i) – The RSEC unanimously agreed to delete the “such as initial perching…” clause and the clause preventing the countability of nocturnal birds released during the day until the following evening. The previous clause is simply impractical in certain circumstances (as in the release of a rehabilitated Horned Grebe for example – how does one wait for an “initial perching” to count that species?). The RSEC also felt that preventing the counting of nocturnal species released during the day could result in that bird being subjected to undue stress the following evenings with birders’ attempts to locate it. The RSEC felt that it was in the nocturnal bird’s best interest to be countable upon release. Rule 3.C(iv) – The RSEC unanimously agreed to remove the clause addressing banders in keeping with the above-noted changes to Rule 3.B and 3.C. The RSEC also agreed that a level “listing field” for all birders was the better option. Banders may still count the birds they band if they see them in accordance with Rule 3.C(i), of course. Rule 4.A – The RSEC unanimously agreed to delete the “while it is wild and unrestrained” clause because a documentation may occur during banding. Rule 4.A(ii) – The RSEC unanimously agreed that many birders learn about species by having a trip leader or a fellow birder tell them what they are seeing. The RSEC felt that this camaraderie represents much of what this hobby is about, and the language of the Recording Standards should reflect that sentiment. The previous Rule 4.C was removed for similar reasons. The RSEC is currently addressing when an exotic species newly added to the ABA Checklist may be counted. We will post that ruling on our website as soon as we finish our discussions and voting. Additionally, we are working on compiling a file on extirpated exotic species and reintroduced native species that indicates the dates of countability for each species concerned. Should anyone have any questions, concerns, feedback, etc., please feel free to bring them to us at rsec AT aba.org. We will do our best to address them in a timely manner. Lines crossed out are omitted. Lines in bold are added. Members who submit lifelist and annual a life list totals and/or other lists to the American Birding Association for publication in the annual ABA List Report Association’s “Listing Central” must observe the ABA Recording Rules. Many non-members who enjoy maintaining lists may also find these rules useful. The member submitting a list is henceforth in these Rules termed the “recorder”. A bird included A recorder may include a species in totals submitted for ABA lists must have been if the recorder has encountered a bird that is a member of the species in accordance with the following ABA Recording Rules. The bird must have been within the prescribed area and time-period when encountered, and the encounter must have occurred within the prescribed time period. The bird must have been a member of a species currently accepted by listed on the ABA Checklist Committee for lists within its area, or by the A.O.U. Checklist ABA Area, on the AOU Check-list for lists outside the ABA Area and within the A.O.U. AOU Area, or by on the Clements Checklist for all other areas. The bird must have been alive, wild, and unrestrained when encountered. Diagnostic field-marks for the bird characteristics, sufficient for the recorder to identify it to species, must have been seen and/or heard and/or documented by the recorder at the time of the encounter for the bird encountered. The bird must have been encountered under conditions that conform to the ABA Code of Birding Ethics. A. “Within” means that the bird must be within the prescribed area when observed, although the observer need not be. For example, if an observer on the U.S. side of the Rio Grande identifies a bird across the river on the Mexican side, the bird may be counted on his/her Mexican list but not on his/her ABA Area list. (i) The ABA Checklist Area is defined in the ABA’s bylaws and in the current ABA Checklist as the 49 continental United States, Canada, the French islands of St. Pierre et and Miquelon, and adjacent waters to a distance of 200 miles from land or half the distance to a neigh boring neighboring country, whichever is less. Excluded by these boundaries are Bermuda, the Bahamas, Hawaii, and Greenland. C. “Encounter” means seen and/or heard live and not remotely. RULE 2: The bird must have been a species must be currently accepted by listed on the ABA Checklist Committee for lists within its area, or by the A.O.U. Checklist ABA Area, on the AOU Check-list for lists outside the ABA Area and within the A.O.U. AOU Area, or by on the Clements Checklist for all other areas. A. “Species” means that each full species is counted only once on most ABA lists. Additional subspecies or color morphs are not counted as additional entries except on lists specifically defined to include such identifiable forms. (vvii) hybrids are not countable. Any bird with physical characteristics outside the natural range of variation for the species and clearly suggesting that it is a hybrid should be treated as a hybrid under the ABA Recording Rules. Songs Song in oscine passerines are is a learned behavior and should not be used as evidence of hybridization; with that group. C. A.O.U.“AOU Check-list“ means the latest edition of the A.O.U. Checklist American Ornithologists’ Union Check-list of North American Birds and its Supplements. D. “AOU Area” means the geographic area covered by the AOU Check-list of North American Birds. E. “Clements Checklist” means the latest edition of “The Clements Checklist of Birds of the World: A Check List”, by James F. Clements, and its Supplements Updates and Corrections. E F. The taxonomic status of a bird as a full species, and thus its countability, is determined by the standard for the list on which the bird is to be counted. The ABA Checklist is the standard for all list areas contained completely within its the ABA Area. The A.O.U. AOU Check-list of North American Birds is the standard for all list areas contained completely within its the Check-list‘s area, covered and with at least some portion outside the ABA Area. The Clements Checklist area. Clements of Birds of the World is the standard for all list areas with at least some portion outside the A.O.U. AOU Check-list area. (Updated supplements will be issued annually for the ABA Checklist, the A.O.U. Check-list and Clements.) Thus, it is possible that two birds seen in the continental USA would be counted as one species on state and ABA Area lists, and as two species on a World List, or vice versa (from Winging It, October 1992, p. 20)., if their taxonomic treatment differs between the ABA Checklist and the Clements Checklist. F G. Updated supplements will be issued annually for the ABA Checklist, the A.O.U. Checklist AOU Check-list, and the Clements Checklist. Should updating supplements be overdue by one year for any of these three standards, recorders may petition the ABA Recording Rules Standards and Ethics Committee for exceptions to the standards, based on recent publication of a significant taxonomic change. B. “Wild” means that the bird’s occurrence at the time and place of observation is not because it, or its recent ancestors, has ever been transported or otherwise assisted by man for reasons other than for rehabilitation purposes. (i) An otherwise wild bird that voluntarily uses or is attracted to a feeder, nest box, tape recorder audio playback, ship at sea, or other nonnatural device, without being captured, is still considered to be wild. Physical contact between an observer and a bird does not automatically preclude a bird from being counted, as there are situations where wild birds have learned to eat from outstretched hands, or have used people as temporary perches. (iii) Birds Individuals of exotic species descendant from escapes escapees or released birds are considered “wild” when they are part of a population which that meets the ABA Checklist Committee’s definition of an established introduced population. C. “Unrestrained” means not held captive in a cage, trap, mistnet mist net, hand, or by any other means, and not under the influence of such captivity. A bird is considered under the influence of captivity after its release until it regains the activities and movements of a bird which that has not been captured. (i) A bird is under the influence of captivity during its initial flight movement away from its release point and during subsequent activity reasonably influenced by the captivity, such as initial perching and preening or early sleeping or roosting near the release point. (iii) A wild bird that is injured, sick, oiled, or otherwise incapacitated, but which retains a reasonable freedom of movement, may be counted. D. “When observed” encountered” means that a bird alive and unrestrained when observed, but which later dies or is collected or captured, may be counted. RULE 4: Diagnostic field-marks for the bird characteristics, sufficient for the recorder to identify it to species, must have been seen and/or heard and/or documented by the recorder at the time of the encounter for the bird encountered. A. “Diagnostic field-marks” characteristics” means the natural characteristics needed to uniquely determine the species of the bird while it is wild and unrestrained.. It is not necessary to experience every possible field mark diagnostic characteristic, but simply sufficient field marks characteristics to eliminate the possibility of the bird being any other species. 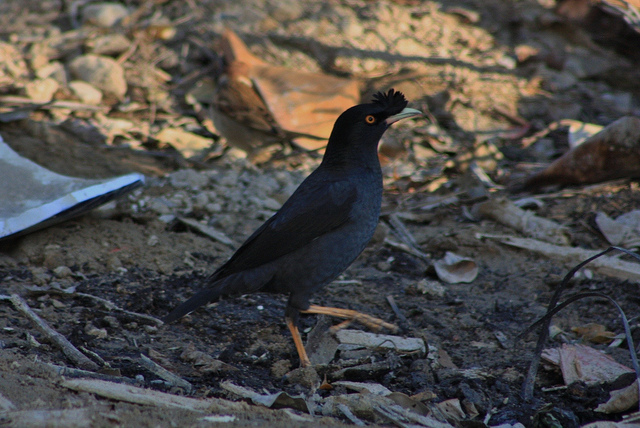 (ii) Identification of the bird may be made subsequent to after the initial encounter. It is not always possible to secure a positive identification initially, but, using physical and/or written documentation made at the time of the encounter, identification is sometimes possible after the fact, upon consultation with of references and/or other authorities. In rare, With very tricky identifications, for example, photographs or recordings sometimes reveal minute, yet critical, details, that were not visible discernible during the initial encounter. Furthermore, our knowledge of how to separate similar species in the field is continually advancing. On rare occasions, a species may not be identifiable until after it has been captured and studied in the hand, or had feather and blood samples analysed analyzed. In such instances of “after-the-fact” ID, the bird may be counted on one’s life-list lists. (iii) Since all recorders, from time to time, have birds pointed out and identified to them by others, it is not necessary that the recorder be the one who identifies the bird species, merely that he/she sees and/or hears sufficient diagnostic field marks at the time of the encounter. (ii) A recorder may identify the bird encountered based on information and/or documentation provided by other observers. B. For a first encounter with a species, no matter which list is involved, identification may be by sight or sound. The sighting or sounding encounter may be brief, but in combination, field marks characteristics seen or heard must be sufficiently distinctive to distinguish the bird from all other species. Recorders must also assure themselves that tape recordings audio playbacks are not being mistaken for birds. RULE 5: The bird must have been encountered under conditions that conform to the ABA Code of Birding Ethics version current at the time of the encounter. In any situation for any list, a species may not be counted if the attempts to see or hear the bird are in violation of the this ethical provisions of Rule 5. A. “ABA Code of Birding Ethics” means the Code of Ethics adopted officially by the ABA at the time of the observation.